Poll is an ideal option to analyze the pulse of your readers or collect their opinion. It is also a part of our social media marketing strategies. As you know, Facebook is the major platform for digital promotions. So most of our modern marketing campaigns revolve around company’s official Facebook pages. A Facebook poll will improve the user engagement on those pages and helps you grow the network as well as the business. A social media marketing manager should keep an eye on the latest trends and need to use various tools for the success of their campaigns. Poll is popular among them. Let us check how to create a Facebook poll. Sign into your Facebook account first and open the desired page where do you want to create the poll (with administrative privileges). Type Poll in the top search bar and hit the search button. The search results will show multiple apps for creating polls. Choose the first app. Grant necessary permissions to access and manage your account. Once you finished, a page will open with poll settings. Choose your poll destination in the first step. The poll can be published in both profile and pages. 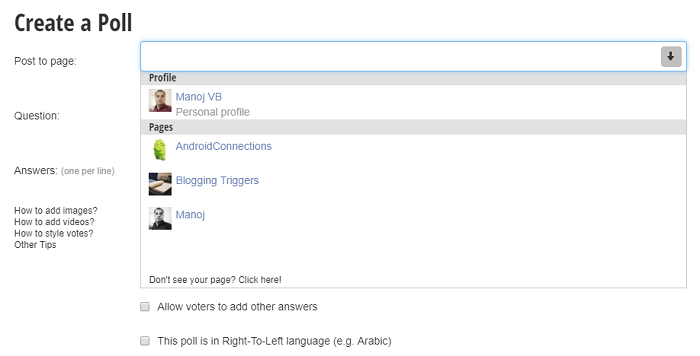 Enter your question, answers, tags and manage other poll-related settings. Then click the Create Poll button to finish. That’s all. You’ve successfully created a Facebook poll. Now you can publish it on the wall, share among other social networks or embed it on the website. Open the settings to edit, delete polls, stop voting and download vote list. Do you want to create more stylish and advanced polls for the business pages? Opt for social media marketing services that offer several tools for competitive analysis and web management. Agora Pulse is such a prominent tool which I use for social media promotions. It also lets you create polls, quizzes, contests, sweepstakes and coupon campaigns on Facebook pages. Let us check how to create a Facebook poll via Agora Pulse. Sign into your Agora Pulse account, choose a Facebook page from the left pane of the dashboard and visit Apps menu. Type the name of your campaign and set a starting, end date for it. Tap Next. Choose the poll layout and age restriction, country restriction if any. Then click on Create button. Now it will ask you to add entries. You can add up to 50 entries per campaign. Go to New Entries and add the first answer option for your poll. Upload photo or video to give professional look to each of your entries. Customize your theme, edit entries, enable/disable options and manage other settings through the page. When you finished, hit the Install tab to upload the poll to your Facebook page. Done. A new menu will be added to the left pane of your Facebook page with the name Fan Votes. It will be blank until the scheduled start of your campaign and will display “there is no fan votes currently running” message to the fans. Once it started, you are able to share the poll with social media followers, invite friends to participate and embed it on the websites.